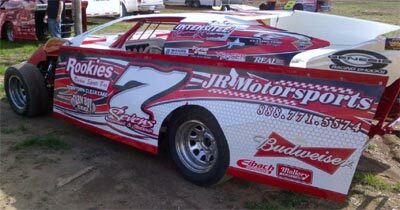 After a slow start to the 2012 season, USMTS legend Al Hejna is looking to reload for the 18 race “Hunt for the USMTS Casey’s Cup”. A combination of personal reasons and little time to work on the car have shifted Al’s focus to the end of the season. The beginning of the year saw Al and fellow driver Corey Dripps looking forward to the race season. They both had new 2012 B.C. Chassis’s, a big change from the 2011 season. Last season Al had a Chevy chassis and Corey had a Ford chassis which did not allow them to share information and set ups, both of which are vital to teammates succeeding in the series. They both are running Chevy chassis’s this year. “The information we can share with each other is an integral part of success for us. Whether it is a different shock package, or maybe gears or even a spring it all adds up at the end of the day” Al stated. Also hindering Hejna this year was the distance to the shop that he and Corey shared. “With us being teammates we thought that sharing his shop would be the best way for us to run good and help each other. But it was an hour and a half drive for me one way, so that’s three hours a day. That was just too much for me to do along with running my restaurant and my family. So I started working out of my shop that I have and while it didn’t improve the way I have been running it has made it easier to work on the car” Al said. The competition level in the USMTS is among the best in the world. “There are 10 or 12 guys on any given night that can win. Terry Phillips, Kelly Shryock, Jon Tesch, Dereck Ramirez, Ryan Gustin and the list goes on and on. The series over the last 5 years has grown and improved so much that you cant show up to the track without your car being in A+ shape. You have to be perfect, draw good and run good to win now. That says a lot about the series and also how the drivers have evolved and gotten a lot more serious” Al said. “My problem this year has been a combination of bad runs, bad draws and bad luck. Throw in a few personal things and my season has gone down hill. I am really gearing up for the Hunt. I just found out that I got a couple big sponsors in Snickers and Casey’s. That will help immensely with the cost of fuel and entry fees. Every little bit helps” said Hejna. Al wanted to thank all his sponsors for standing behind him thru the good and the bad. “My sponsors have had to put up with a lot. I want to thank Corey Dripps and B.C. Chassis for the great cars, JR Motorsports for the awesome horsepower under the hood, Genisis Shocks, Eibach Springs, Farmboy BBQ, Budweiser and Rookies Rockin Sports Bar. These guys plus lots of others help me when I need it and it means a lot to see their names on the side of my car” says Hejna. You can see Al on July 25th at the four days special at the Deer Creek Speedway located in Spring Valley Minnesota. Make sure you go out and say hi and cheer on him and the other Dirt Knights. They always put on a thrilling show. • 27 years racing: Hobby Stocks, Limited Late Models and Modifieds since 1992. • 10 points championships at racetracks in Algona, Britt, Cresco and Mason City, Iowa. • 110 career feature wins, including 23 USMTS National Tour victories. 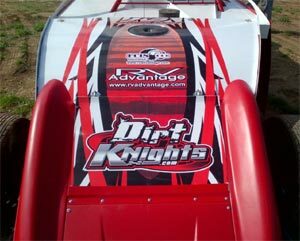 • Two-time winner of the “Ron Efkamp Memorial Race of Champions” at the IMCA Supernationals.